As difficult as it is to have your first big success, most people find it exponentially harder to repeat success. So many of us, after "bringing the crowd to its feet," worry that we're going to get booed off the stage with our next venture. Is there a way to avoid this, to have multiple hits and "endless encores?" Technology executive and bestselling author Ken Goldstein shows the way to repeating success by concentrating on three essentials – people, products, and profits, in that order. In this affecting and instructive business parable, he tells the story of a man who has accomplished much but now fears exposure as a fraud and the woman who, as a CEO with multiple successes to her credit, shows him the secret to consistent achievement. 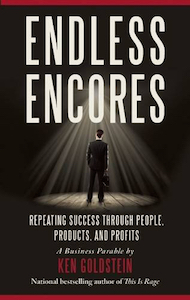 Are you ready to play endless encores? If so, this is your story.